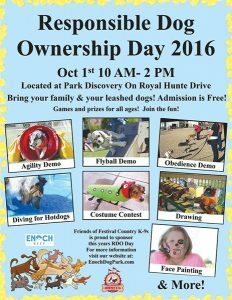 Responsible Dog Ownership Day is an event that will be on Saturday, October 1st, 2016 from 10:00 am to 2:00 pm at Park Discovery on Royal Hunte Drive. Bring your family and your leashed dogs. Admission is free! Games and prizes for all games. Join the fun! 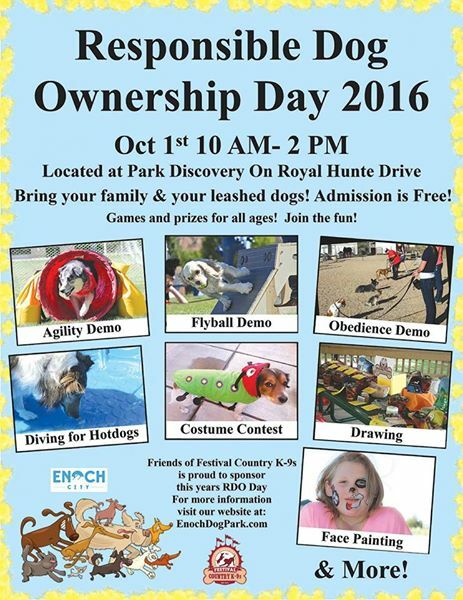 Activities for you or your dog include agility demo, flyball demo, obedience demo, diving for hotdogs, costume contest, a drawing, face painting and more. Friends of Festival County K-9’s is proud to sponsor this years RDO Day. For more information visit their web site at EnochDogPark.com.